Andres Santana did something he hadn't done in his five-season career in July 1991: He hit a home run, according to The Arizona Republic. He also did it the hard way, hitting an inside-the-parker, The Republic wrote. "I'm not supposed to hit home runs because I'm so skinny," Santana told The Republic afterward, "but now I finally can say I did it." By that point, Santana had already done something else. He made the major leagues the year before, getting into six games for the Giants in San Francisco. Santana never hit another home run. He also never returned to the majors. Santana's career began in 1987, signed by the Giants as a free agent out of his native Dominican Republic. 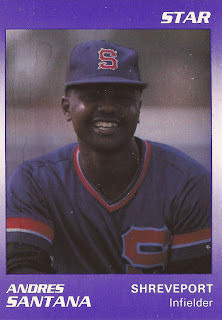 Santana started with the Giants at rookie Pocatello. He hit .262 in 67 games. He also stole 45 bases. He knocked in the game-winner on a single in a June game against Salt Lake. He moved to single-A Clinton for 1988, playing most of the year there, but also getting 11 games at AA Shreveport. Between the two levels, he stole 91 bases. Santana then moved to single-A San Jose, but only got into 18 games. A broken ankle sidelined him the rest of the year. He returned to the field and to Shreveport for 1990. He got into 92 games, stole 32 bases and hit .292. He also earned a September call up to San Francisco. Santana got into six games for the Giants to close out the year. He got two at bats, recorded one RBI, but didn't get a hit. Santana played 1991 back in the minors, at AAA Phoenix. He hit .316 in 113 games, but didn't return to San Francisco. After not being recorded as playing in 1992 due to a shoulder injury, Santana moved to the Marlins and AAA Edmonton for 1993. He got into 61 games there and hit .228, rounding out his career.